California’s glamorous new governor will live in Sacramento’s historic Governor’s Mansion. Ronald Reagan, Nancy Reagan, Jerry Brown and pre-literary fame debutante Joan Didion blindfolded in a bedroom make cameo appearances in this house of thrones housing saga with a surprise happy ending. SACRAMENTO, Jan. 5, 2019 — Gov. Ronald Reagan and his wife, Nancy Reagan, famously called it a firetrap. The state fire marshal agreed and condemned California’s historic Governor’s Mansion shortly before it became a museum, a relic of the state capital’s past that clashed with its future for the next 50 years. The Reagans and their 8-year-old son, Ron, moved out of the 30-room Second Empire–Italianate Victorian home in early 1967, just four months after moving in, decamping a declining downtown Sacramento neighborhood Nancy Reagan called “an awkward place in town,” unsafe for small children, in favor of a leased six-bedroom, four-bath house in a luxe residential enclave east of downtown known as The Fabulous Forties. California purchased the mansion, adjacent carriage house and grounds at 16th and H streets in 1903. Thirteen governors lived in California’s Governor’s Mansion from 1903 to 1967, when its operation was assumed by the state Department of Parks and Recreation. After decades of budgetary and closure threats, the Governor’s Mansion was renovated in 2015 at a cost of $4 million. Gov. Jerry Brown then moved in with his wife, Anne Gust, and dogs Sutter and Colusa for the last three years of his historic four-term, 16-year tenure. Flexing his temperamental austerity after succeeding Reagan for his first two terms beginning in 1975, Brown refused to live in an alternative, contemporary new governor’s residence built on 11 riverfront acres in a Sacramento suburb, declaring the 12,000-square-foot “Taj Mahal” “not my style” and opting instead to live in a spartanly furnished apartment on the top floor of a 1929 Spanish Eclectic building two blocks from the Capitol. Thus began the long, strange real estate saga of the mansion that Reagan’s friends built, which Sacramento native Joan Didion dubbed “an enlarged version of a very common kind of California tract house.” The maligned substitute mansion was occupied for years solely by live-in caretakers, was eventually sold and to this day features a brick pillar entrance gate with a plaque bearing the compound’s name, La Casa de los Gobernadores. Governors following Jerry Brown after his first two terms ended in 1983 — George Deukmejian, Pete Wilson, Gray Davis and Arnold Schwarzenegger — lived in leased suburban Sacramento homes that were criticized for being too far from the Capitol or commuted to Sacramento movie-star style via private jet from Los Angeles, personally paying $62,000 a year to retain a hotel penthouse suite across from the Capitol. Before moving into the Governor’s Mansion, listed on the National Register of Historic Places, Brown leased a 1,400-square-foot downtown loft in a reclaimed auto dealership three blocks away. On Monday, Gavin Newsom will be sworn in as California’s 40th governor and will move from Marin County into the Governor’s Mansion with his wife, Jennifer Siebel, and their four children, Dutch, Hunter, Brooklyn and Montana, ages 2 to 9, the oldest just one year older than Ron Reagan Jr. was 52 years ago when his mom called the house and the neighborhood unsafe and undesirable for children and adults alike. Twenty-one years before the Reagans moved in and abruptly moved out, Sacramento-born author Joan Didion was initiated into an exclusive high school sorority in the Governor’s Mansion at age 14 in 1948, blindfolded in the bedroom of Gov. Earl Warren’s daughter Nina. Having been elected to California’s highest office, Newsom has seen optics and reason: The governor of the most diverse state in America can’t afford to commute to work from racially, economically and politically homogeneous Marin. As California’s incoming governor, Newsom and his family are moving to Sacramento at a time of profound demographic and economic change in the downtown area surrounding the 142-year-old Governor’s Mansion. Stately perched on the corner of a tree-lined thoroughfare historically known as State Route 40, the renovated Governor’s Mansion is among the last few single-family residential mansions in a part of Sacramento known as Mansion Flats, once home to the grandest of downtown houses, many long ago converted to hotels, offices and apartments. The picaresque American Legion bar that abutted the Governor’s Mansion in Nancy Reagan’s era has joined dead soldiers, replaced by a hip taqueria and cantina. The shuttered eye-sore hotel in the Governor’s Mansion’s direct view — where Gov. Pat Brown used to swim before a local newspaper photographed him en route to the pool in robe and flip-flops and his wife insisted on building a swimming pool at home — is being renovated as housing and retail. Modern new apartments recently revitalized a dark parking lot across the street. The former circus tent musical theater a block away is now a bone fide, bank-sponsored performance center. An independent coffeehouse will soon replace a long-gone Starbucks on the corner to the west. Major agriculture processor Blue Diamond Almonds is sprucing up its nearby headquarters to the north to highlight its retail store and visitors center. Mere blocks away, Sacramento’s Memorial Auditorium, Convention Center and Community Center Theater are all being upgraded. Restaurants, bars, retail, hotels and theaters blossom to west in revitalized downtown and to the east in trendy midtown. Mass murdering grandma Dorothea Puente lived and killed three blocks away but you seldom hear her name. Meanwhile, kid-friendly and dog-friendly beer parlor Capital Hop Shop two blocks away is on everyone’s lips. Downtown Sacramento and the neighborhood immediately surrounding the Governor’s Mansion are a lot safer and more attractive today than they were in Nancy Reagan’s day. Sure, a deranged man broke into the residence in April 2018. Seven months later at Gavin Newsom’s Marin County home, a strange man evaded security and approached Newsom’s 7-year-old son, Hunter. 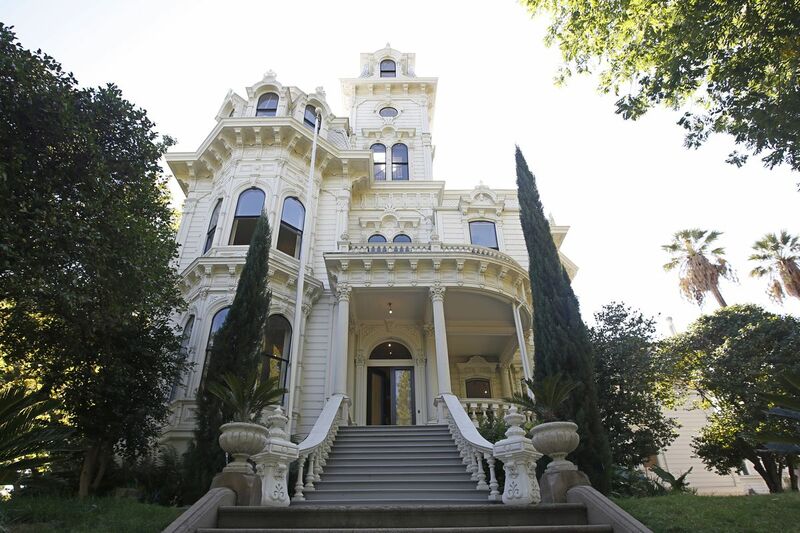 Last week, after months of speculation whether Gavin Newsom would move his family from marvelous Marin to less sophisticated Sacramento, I asked the state Department of Parks and Recreation if the Governor’s Mansion would become a museum once again if Gov. Gavin Newsom did not move in. Parks and Rec said it had no information at the time. On Friday, Newsom announced he and his family will move to Sacramento after he’s sworn in Monday. This house of thrones housing saga has a surprise happy ending in addition to cameos by Ronald Reagan, Nancy Reagan, Ron Reagan Jr., Jerry Brown and dogs Sutter and Colusa, and pre-fame debutante Joan Didion blindfolded in a bedroom.